Generate Traffic, Leads, and Revenue With Drupal 8! See how to Search Engine Optimize your Drupal website with this visual, step-by-step guide to Drupal SEO. You'll get the exact drupal modules, settings, and configurations your site needs to get the best possible rankings in Google and other search engines. Get optimized and stay optimized by using this book along with the Drupal SEO Checklist module that goes with it. Install the free module (the URL is in the book) and follow along with your site. The book and module combine to make this the easiest way to do Drupal SEO. Either you took it over, your company built it, or you’re about to launch a new endeavor and Drupal 8 is the right technology you need to get the job done. Ben Finklea has been working on the Internet since 1995. He has started four companies and is currently the CEO of Volacci. He lives near Austin, Texas which is every bit as cool as you’ve heard. A graduate of Texas A&M University, Ben is a frequent speaker at conferences on the subjects of Digital Marketing, Drupal, and building successful high-tech businesses. He is the author of Drupal 6 Search Engine Optimization (Packt, 2009) and created the Drupal SEO Checklist module, which has been downloaded over 300,000 times by Drupal site owners worldwide. Ben has built and managed SEO campaigns for many companies including HP, Fast Company, Oracle, State Farm, Acquia, and Amazon. Available in print, PDF, EPUB, and Kindle. WITH OVER 150 IMAGES TO GUIDE YOU EVERY STEP OF THE WAY, THIS DRUPAL SEO BOOK DELIVERS THE KNOWLEDGE YOU NEED TO GET YOUR DRUPAL SITE LISTED AND RANKING HIGH IN THE SEARCH ENGINES. WITH OVER 150 IMAGES TO GUIDE YOU EVERY STEP OF THE WAY, THIS BOOK DELIVERS THE KNOWLEDGE YOU NEED TO GET YOUR DRUPAL SITE LISTED AND RANKING HIGH IN THE SEARCH ENGINES. This Drupal SEO book is the shortcut to getting your Drupal 8 website optimized, ranking, and working for your business. You Already Use the Drupal 8 SEO Checklist Module. 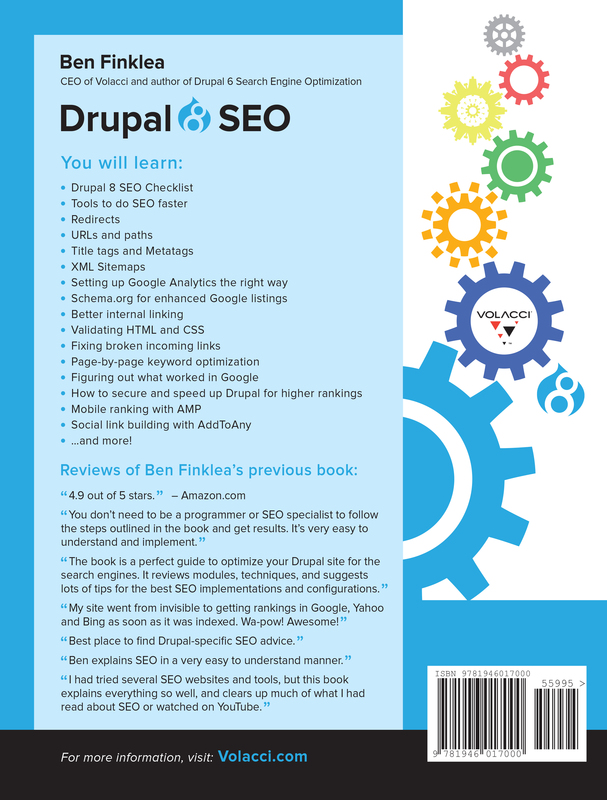 I created this book to be a supplement to the Drupal SEO Checklist module for Drupal 8. If you’re already using the module, this book is for you. You’ve Invested a Lot in Drupal 8. All the hard work your team has done to create a great website will go to waste if you don’t generate a steady flow of customers ready to buy, sign up, or join. You’re Not Looking For an SEO Education. This book is short on SEO “whys” and long on Drupal 8 “how-tos”. Instead of rehashing common SEO concepts, I’ve linked to trusted online resources that explain the basics. Drupal does SEO differently. This book empowers you to be more productive & successful using Drupal best practices (also known as The Drupal Way). This book will help you implement that strategy. Ranking well in Google matters. A lot. It’s not an afterthought - or at least it shouldn’t be - it’s at the forefront of your mind as a marketer. Companies that rank well in Google win. Companies that don’t rank are not even in the running - it’s just that simple. They say a picture is worth a thousand words so there are over 150 Drupal 8 screenshots in this book. My goal is for you to see exactly what to do, where to click, and how things work. IF YOU'RE READY FOR RESULTS WITH THE MINIMUM OF HASSLE, DRUPAL 8 SEO WILL LEAD THE WAY TO A SUCCESSFUL SEO MARKETING CAMPAIGN ON YOUR WEBSITE. YOU'LL WANT TO ADD THIS TO YOUR COLLECTION OF SEARCH ENGINE OPTIMIZATION BOOKS. HomeWhat Will You Learn?Is This Book For You?